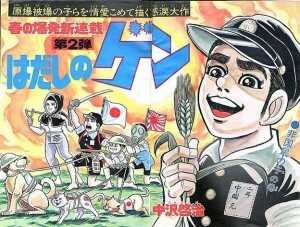 We’re slowly getting more details on last week’s news that Keiji Nakazawa’s manga Barefoot Gen had been banned from yet another Japanese school district. According to major sources including Asahi Shimbun and Mainichi Shimbun, Izumisano City officials planned to return the book to school library shelves last Thursday, following a review of the content. Izumisano mayor Hiroyasu Chiyomatsu ordered Gen removed from schools back in November, after he read it upon hearing about the previous ban in the city of Matsue. But while Matsue officials blamed gruesome wartime imagery for their removal of the book, Chiyomatsu cited “many discriminatory expressions” such as kichigai (madman) and kojiki (beggar). As an anonymous school principal pointed out, however, this justification rings a bit hollow as there are plenty of other books that contain potentially offensive terms but were not targeted for removal from school libraries. What is necessary is not to scour books for inappropriate words with the intention of keeping them out of reach of children. It is important to help children understand why expressions that are better left unused today are used in certain literary works and why the authors used them. That requires careful efforts to give children necessary knowledge about historical backgrounds and useful perspectives. If any of our faithful readers can provide further verified information on this story–particularly whether all copies of Barefoot Gen were in fact restored to Izumisano schools on March 20 as the school board had promised–please send tips to info@cbldf.org!